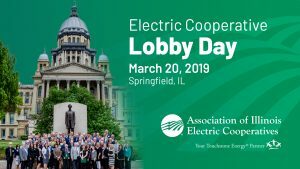 Please join us on Wednesday, March 20, 2019, for Electric Cooperative Lobby Day at the Illinois State Capitol. The Wyndham is located in downtown Springfield, just seven blocks from the Capitol. Following the briefing, co-op reps will walk to the Capitol for a quick group photo out front by the Lincoln statue, then head in to visit with your legislators whose districts include your co-op’s service territory. To assist you in scheduling these visits, we can provide contact information for their Springfield office in advance. We would anticipate that co-ops should be able to complete their visits and back on the road late afternoon. Electric Cooperative Lobby Day is a great opportunity to fly the co-op flag and build important relationships with your local legislators. Cancellations made prior to the registration deadline (March 15, 2019) will be not be charged. Cancellations made after the registration deadline, but within 48 hours of the event will be charged at 50%. Cancellations thereafter/no shows will be charged the full registration amount. Substitutions are allowed.